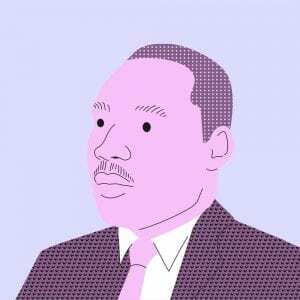 These Martin Luther King Jr. quotes provide insight into the kind of man he was, as well as stir inside us a great feeling of inspiration. A talented speaker, King had a knack for words and a way of delivering them that is often unmatched by today’s public speakers. Here is a selection of some of his most poignant sayings, which still ring as true today as when they were first spoken. This is a great quote that reminds us that defeats, setbacks, and disappointments only last for so long. You can keep your hope even through these times, and in fact it is essential in overcoming them. 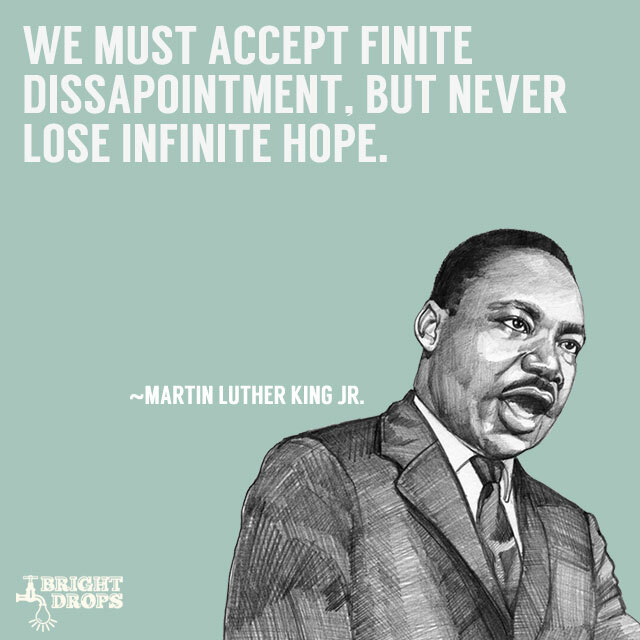 During his lifetime Dr. King experienced plenty of times that would have caused many to give up, but he kept on with determination because he was able to keep hold of his hope and not let it go. It’s not only something he said, but something he lived and provided an example for the rest of us. It can be so hard to take that first step when the rest of the journey is unclear, or even totally unknown. But that is what life is like, each step we take is really a step of faith because we never know what’s ahead, we just have to carry on and deal with what happens next to the best of our abilities. Here Dr. King reminds us that we’ll never be able to see the whole staircase, no matter if it’s an important project, a relationship, or the totality of our lives. It matters not, because as long as you have faith in that first step, the next will appear. 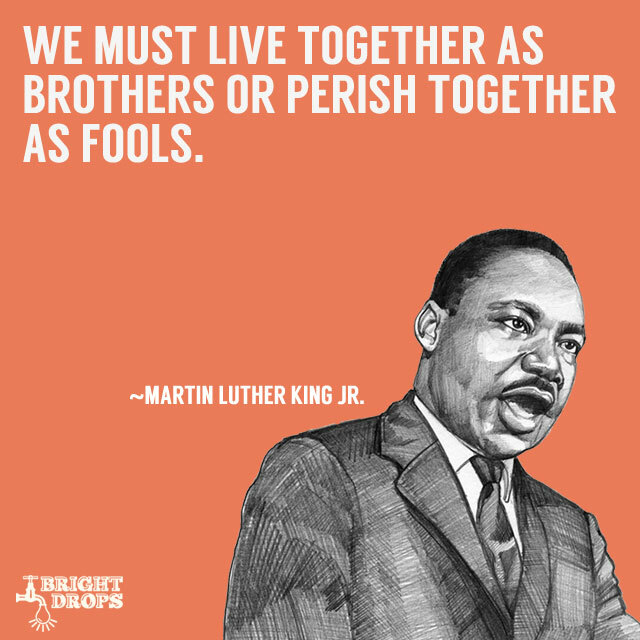 This quote is in line with many of the things that Dr. King fought for and spoke of during his lifetime. It sums up the fact that while we may all be from different races, different cultures, different social backgrounds, and different economic classes that we’re all on the same boat, Earth, and we need to figure out our differences and learn to cooperate with each other. 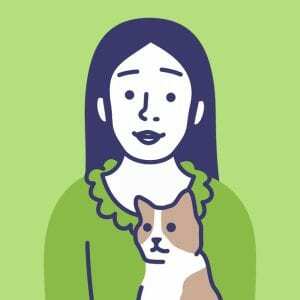 It’s easy to take a myopic stance on the world around us and view others as different, but the fact remains that we’re still all homo sapiens trying to survive on the same planet. It’s odd to hear a public speaker talk about love, but he’s right on with this quote. While many of us don’t take on the task of turning enemies to friends, there’s only one way to go about it. It doesn’t matter if your enemies regard you as a friend or turn their hatred into love, because that’s on them. All you can do is control your own emotions and feelings towards others. 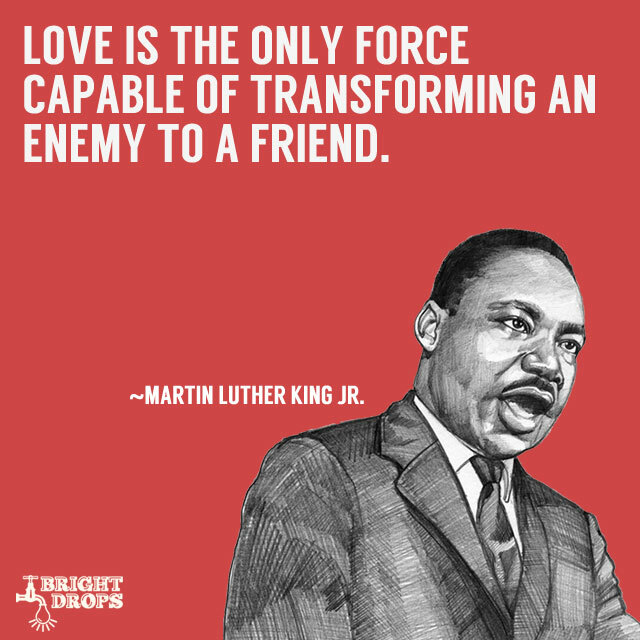 Perhaps what Dr. King was saying was to love your enemies regardless if there’s an actual change in your relationship with them. 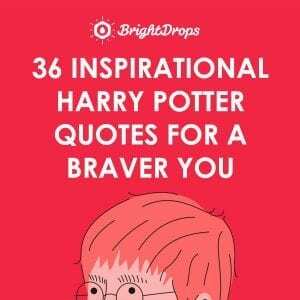 The perfect quote for those dark times when all seems lost. 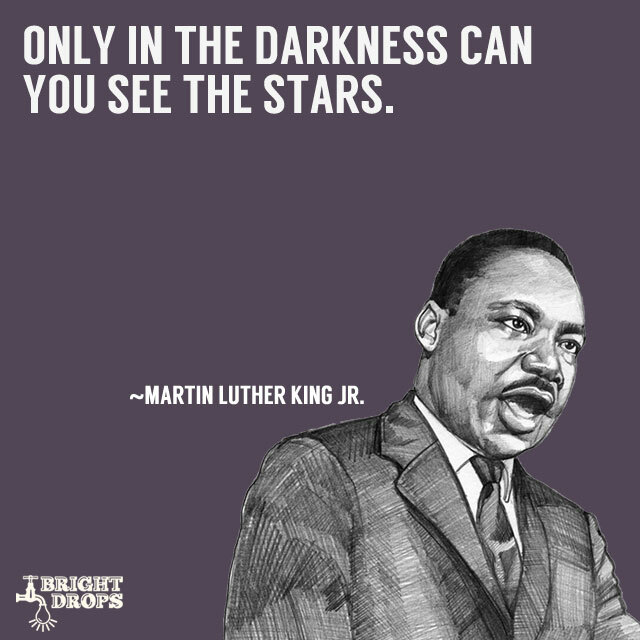 Dr. King points out that it’s when things seem at their worst that you can find the beacons of light in your world that can help steer you back on course. In context he was likely speaking on bigger problems and the world at large, but it’s often in these grander statements that we can pull a kernel of truth and apply it to our own lives. Each of us has a different idea of what we consider the stars in our lives, but phony stars will not shine during dark times. Finding out your life’s mission is closely linked with the things you are most passionate about. 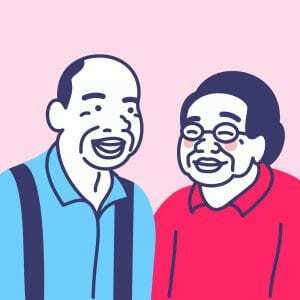 It can be hard to know what you’d die for, since most of us are so focused on staying alive. Searching yourself for that thing or things that you feel most strongly about is key to knowing what your grander purpose is. For some it’s their children, for others their life partner, for some it’s their career or legacy, and for others it’s helping others and righting some of the problems they see in the world. Determine what it is you’d die for so you have a strong conviction of why you’re alive. 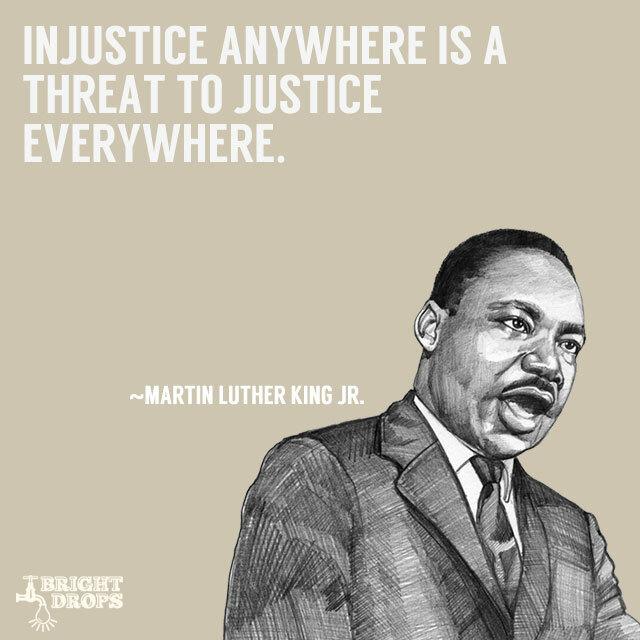 Dr. King spent much of his life trying to right some of the wrongs he saw in the world, and this is a quote that must have inspired him on a daily basis. He is basically making the statement that any amount of injustice anywhere in cause for concern for justice seekers the world over. It is a call for people to not be complacent about the tragic conditions that exist in remote parts of the world because those are just as important to justice as the issues we face in our own backyards. 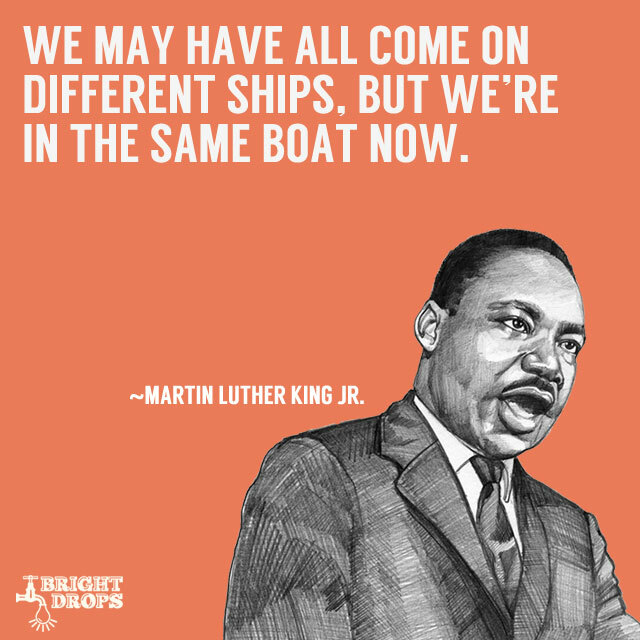 This quote makes just as much sense today as it did during the times of Dr. King. With terrorism at an all time high and random shooting happening more than ever it seems that we still haven’t learned the wisdom behind this quote. What will it take for the human race to live together in a brotherly fashion instead of always at war and with so much violence? Hopefully we’ll figure it out before too long and put an end to some of the bloodshed and tyranny that still exists in the world. 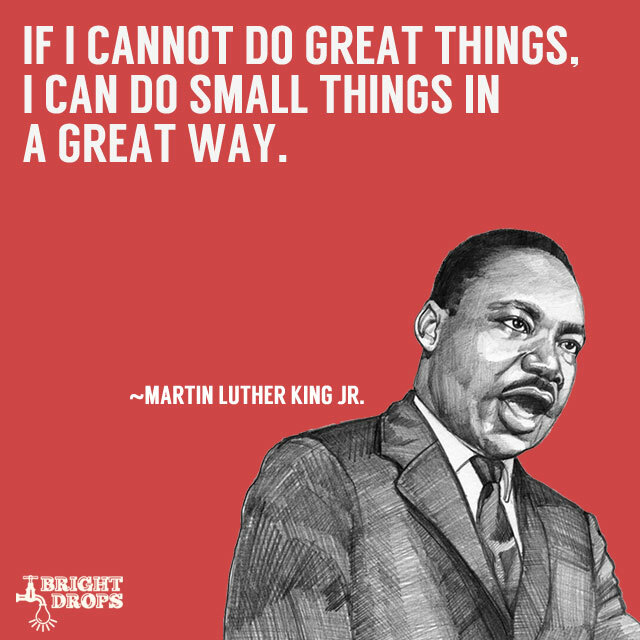 Each of us does not have to go down in history the way Dr. King has, with monumental speeches and a life dedicated to serving others, but we can do the things we do in our lives as great as we can. This is advice that anyone can put into practice immediately and see a marked improvement in the quality of their lives. Many times we brush over the daily tasks in our lives without putting much thought into them. By focusing on doing even the small things as best as we can it has a trickle up effect into other areas of our lives and before long we actually do end up doing great things. This is excellent advice for anyone wondering whether the timing is right to do what’s right. 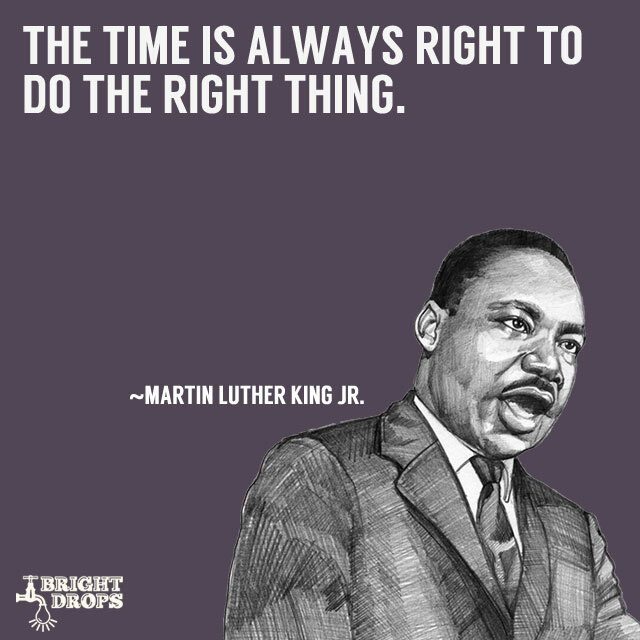 It may have been Dr. Kings attempt to spur people into action that were otherwise waiting for the right time to do the right thing. He was a master at summoning up followers to join him in his cause. This quote can be applied to anyone’s life any time they are choosing between doing the right or wrong thing. 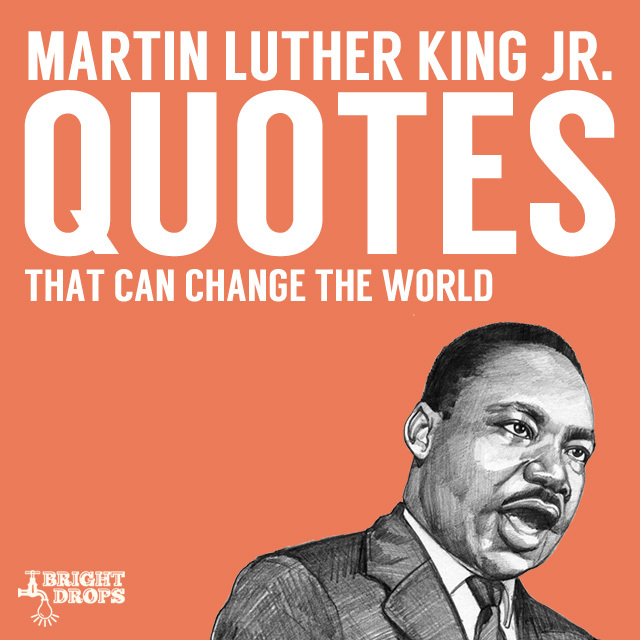 It’s a great way to end our list of inspirational quotes by Martin Luther King, Jr., as it encourages us to get out there and do the right thing every moment of the day.